Daniel Rycroft was born in Spirit River in 1924 to Helen and Robert Henry Rycroft. In 1928 the family left the area to eventually reside in Smoky Heights where Danny took all of his schooling. 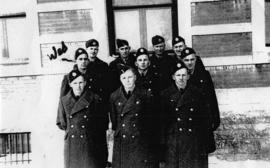 In November, 1942, shortly after his eighteenth birthday, he enlisted in the RCAF. He was on duty overseas in 1944 when he was reported missing in action. A month later his mother received news that he was alive. His plane had been forced down but he had bailed out and had been taken in by a French family. The French underground were able to assist his return to England where he was hospitalized for a fractured spine and ribs. After returning home, he married Violet Spry in May, 1945. They raised a family of six children: Loraine, Greg, Bill, Neil, Jean, and Jack. Danny became a grain buyer for National Grain Co. and then Alberta Wheat Pool for eighteen years. In 1974 he went to work for the County of Grande Prairie. Danny Rycroft died on April 13, 2011. 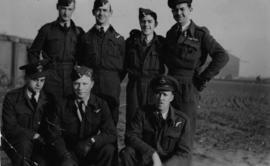 The fonds consists of written memories of Danny's war time career during WWII and his return visit to France in 1997, 56 photographs from two of his albums, (1942-1997), a silk map of Europe, a CANADA badge, and a poster of a replica of a Lancaster Bomber.